"Honey bees are superb beekeepers; they know what they're doing." 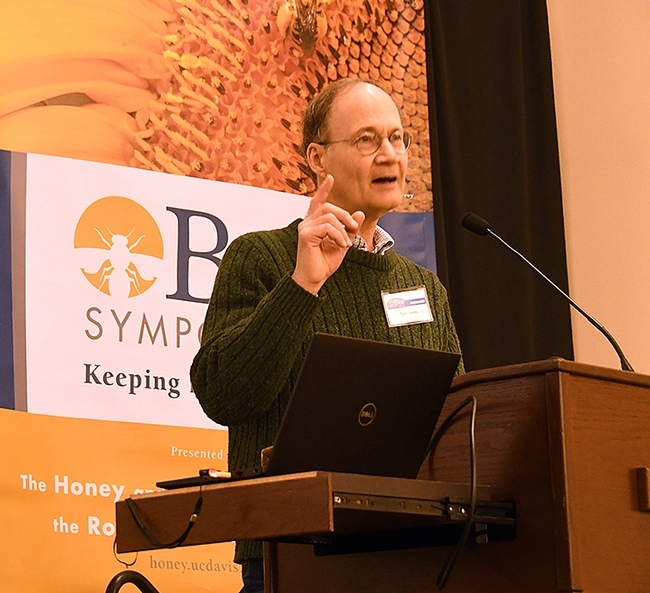 So said bee scientist and author Tom Seeley of Cornell University, Ithaca, N.Y., when he keynoted the fourth annual UC Davis Bee Symposium, held March 3 in the UC Davis Conference Center. 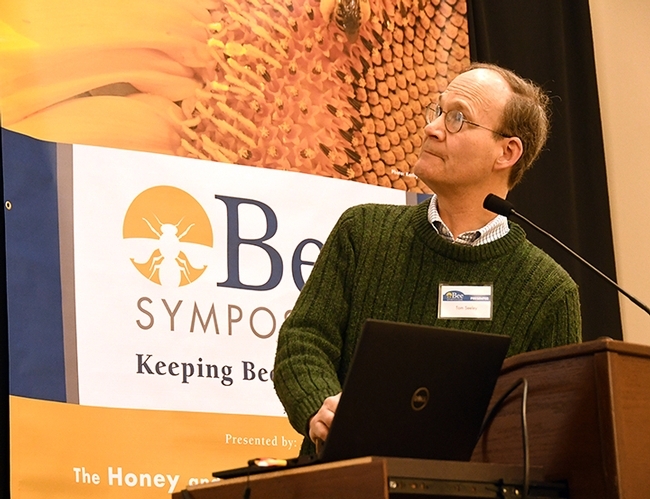 "EVERYTHING that colonies do when they are living on their own (not being managed by beekeepers) is done to favor their survival and their reproduction, and thus their success is contribution to the next generation of colonies," Seeley said in his talk on "Darwinian Beekeeping." Seeley, the Horace White Professor in Biology, Department of Neurobiology and Behavior, where he teaches courses on animal behavior and researches the behavior and social life of honey bees, visually transported the symposium crowd to his research site, the 4200-acre Arnot Teaching and Research Forest owned by Cornell University. Located about 15 miles from the campus, Arnot Forest is a place where the honey bees live in the wild, that is, they are not managed by beekeepers, Seeley pointed out. They build small nest cavities high in the trees, about 25 feet high, and space their colonies apart by at least 750 meters. They build drone comb freely, amounting to 15 to 20 percent of the nest cavity. They live as they did millions of years ago. It's survival by natural selection. "We can learn from the wild colonies," Seeley said. "I go into the wild areas and track down where bees are living and follow the bees home. It takes me about two days to find a bee tree." Does the Arnot Forest have Varroa mites, the worldwide parasitic, virus-transferring mite that's considered the No. 1 enemy of beekeepers? A pest that arrived in the New York area around 1994? Yes, they do. All the colonies in the forest are infested with Varroa mites. And they survive. Seeley's research shows that before 1978 (pre-Varroa mite), the forest contained 2.8 colonies per square mile. After 2002 (post-Varroa mite), the forest still contained 2.8 colonies per square mile. 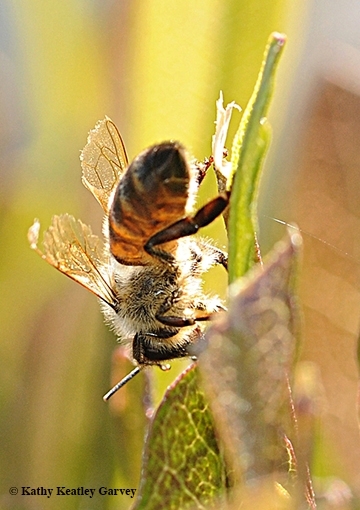 Honey bees typify the Charles Darwinian concept of evolution by natural selection, Seeley said. Indeed, "all bees living today are the products of natural selection." Darwin, who described comb building as "the most wonderful of all (insect) instincts" and Lorenzo L. Langstroth, who invented the movable-frame hive, "both had important insights that can help us with our beekeeping," Seeley related. "Darwinian beekeeping is allowing the bees to use their own beekeeping skills fully." However, Darwinian beekeeping or "bee friendly beekeeping" is not for everyone, Seeley emphasized. "It's not for large-scale beekeepers, it's not for urban beekeepers. It is an option for small-scale rural beekeepers who want to avoid chemical treatments and who are satisfied with modest honey crops." With Darwinian beekeeping, the emphasis is on the "environment of evolutionary adaptedness, "or the original environment in which wild colonies live," Seeley said. "Colonies are genetically adapted to their location." How can beekeepers practice Darwinian beekeeping? "Keep bees that are adapted to your location," he said. "Rear queens from your best survivor colonies, OR capture swarms with bait hives in remote locations OR purchase queens from a queen breeder who produces locally adapted queens." "If the mite level gets high (more than 10 mites per 100 bees), then euthanize the colony; pour warm, soap water into hive at dusk," he said. "This does two things: it eliminates your non-resistant colonies and it avoids producing mite bombs. An alternative to euthanasia of the colony: treat for Varroa and requeen with a queen of resistant stock." The issues of hive size and proximity are also important. Many modern beekeepers use "multi-storied wooden kits, super-sized like McDonald's," the professor said. "And managed bee hives are often a meter away from one another, as compared to 750 meters in the wild." Seeley also said it's important "not to disturb colonies in winter: no checking, no stimulative feeding, no pollen patties, etc. Even a brief removal of the lid causes winter cluster to raise its temperature in alarm for several hours." 4. Line hives with propolis collection screens or untreated lumber to allow them to build a "propolis (antimicrobial) shield"
Seely is the author of Honeybee Ecology: A Study of Adaptation in Social Life(1985), The Wisdom of the Hive: the Social Physiology of Honey Bee Colonies (1995), and Honeybee Democracy (2010), all published by Princeton Press. 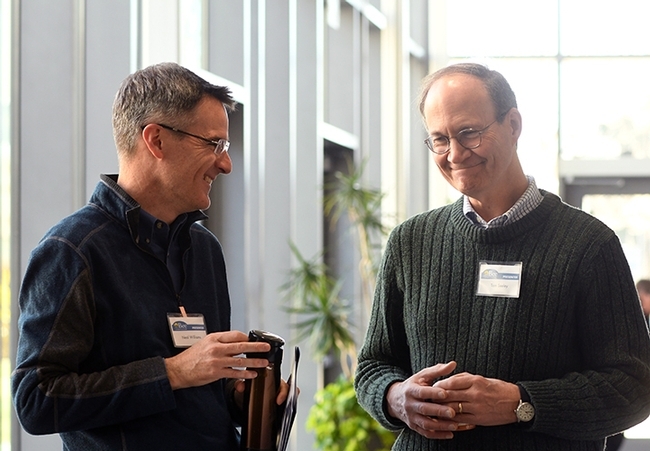 The UC Davis Honey and Pollination Center and the UC Davis Department of Entomology and Nematology sponsored the event, which drew a crowd of 250. Amina Harris, director of the center, coordinated the event. 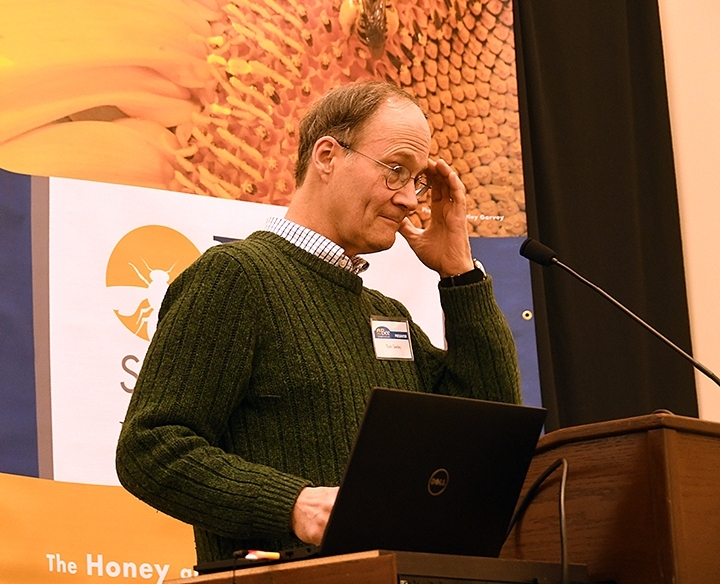 In introducing the keynote speaker, Professor Neal Williams of the entomology faculty and the faculty co-director of the Honey and Pollination Center board, described Seeley's work as "innovative and insightful. He is truly a gifted author who blends science and philosophy." As a new beekeeper I have had to filter all of the things I learned at bee school and then adapt to Dr. Seeley's methods. I look forward to another year with my bees ( and swarms)!